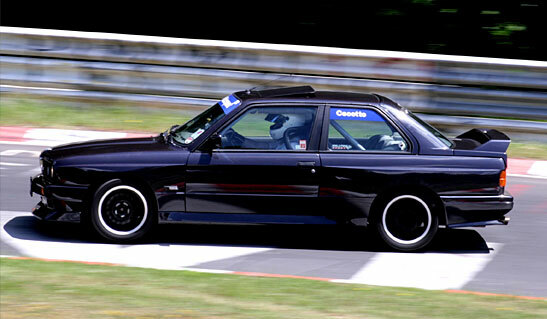 The BMW M3 is based on the E 30 Series and derives its design from the BMW car technology. All the specifications in the car including the engine and the chassis are based on various race car models from BMW. The driving force behind this model is to combine motor sports with everyday driving. However BMW had to follow certain rules and changes in accordance to make the car fit fro street driving. Homologation rules state that a race car must undergo changes in its aerodynamics capability so that it is safer to drive on regular roads. Aerodynamic changes would also mean engine displacement and these changes were applied to the BMW M3. The changes that were made to the current model in discussion are less weight of the car, which also automatically improves the aerodynamics, taller fenders and arches in the front to give it a sports car look and 18 inches wheels to support the car. There were some limited edition models also which featured different color range like the Europa, Ravaglia, Europameister and the Cecotto. The best part of the BMW M3 model is that it has won several road races not alone from the racing point of view but road trips in Australia and other road shows as ell. It has won many accolades for its performance and that is why BMW Company decided to adapt its capabilities to the regular everyday road driving. With every new racing season BMW comes with a fresh and more ambitious recipes designed for success. This has become the trademark for BMW almost. They have always focused on outstanding achievements and setting new records for racing. Having completed all this criteria or launching a new model the BMW came up with a fresh new face called BMW M3. The coupe was well received in the car market and found many enthusiasts as takers. Owning a race car might not do justice to the race enthusiast and since BMW coupled the race car capabilities with the on road capabilities of the car this model BMW M3 has taken off with flying colors. People who have test driven it say that it is a smooth performance and offers sheer driving pleasure which can be given the rating of the highest caliber. The new BMW M3 has raised the bar of expectations for people through its supreme performance and it has great adaptability and the ability to master both the racing and the road based performances. Once you get off the race track with the BMW M3 you find it beautifully mastering the roads with a great sense of maneuvering. The best virtue of the BMW M3 model is still its reliability and performance. It never lets you down and always strives for supreme performance. Only when the driver used the car in its right sense do they realize it’s potential. You notice that from being a dare devil on the race track it neatly maneuvers the controls to the road by being a reliable and safe car.